Laptop Travel Nightmare: What Would You Do? Check Your Verizon or Other Wireless Bill NOW! I always get smiles and questions when I take off my unique WinPatrol 1 GB USB Wristband. I guess it’s not common to have files readily available on your wrist but I can verify it works even if you just carry it in your pocket. This week, while supplies last, anyone who purchases a WinPatrol PLUS Family Pack license will receive a FREE WinPatrol wristband. The USB drive comes with 1 GB of space for music, photos or portable programs like our own included WinPatrolToGo.exe. 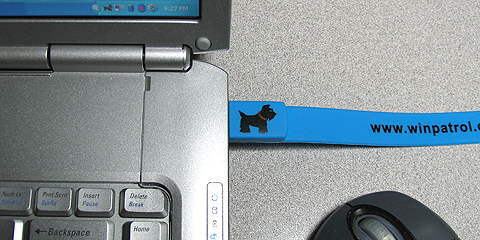 The single file portable version of WinPatrol is designed to run from a SD card or portable USB device without having to be installed on a target computer. While it doesn’t provide real-time detection of changes it will let you clean out the useless, wasteful programs that just take up space and slow you down. Having WinPatrolToGo, especially on the WinPatrol wristband, can optimize everyone’s computer and make you a hero to family and friends. You may not know how useful a handy USB drive is until you don’t have one. The first time I used my WinPatrol wristband was after the death of a family member. In an effort to collect meaningful photos to celebrate his life we passed around a wristband. Everyone in the family was able to copy their favorite photos on to my wristband and a wonderful slide show was created that we all contributed too and shared. If you’re already a WinPatrol PLUS member you can still purchase just a wristband at http://winpatrol.stores.yahoo.net/wiplfapa.html. Supplies are limited so this offer will expire when we no longer have inventory available. What makes WinP so vulnerable to programs that make it disappear. The number of times I've re-downloaded and activated the program is huge. I go back to 2007 as a subscriber and I've had WinP gabbled up during the reigns of Windows XP, Vista, 7 and now 8. I'm not sure what you're experiencing but if you've been with us since 2007 you know what you describe is not normal. I'm sure if you contact support@WinPatrol.com and describe what you're experiencing I'm sure there's a simple solution. If you're finding Scotty disappearing I would bet there is one program that you must use that is removing WinPatrol and there is most likely a way to tell that program WinPatrol is safe and you'll never have a problem again.